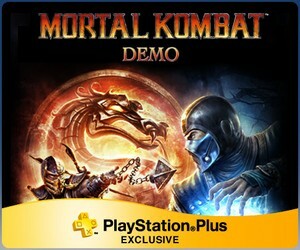 The demo for Mortal Kombat is out for PlayStation Plus subscribers! It will be available for all PlayStation users on March 15. As stated above, there are 4 characters in the demo, plus 2 stages: The Living Forest and The Pit, the later features a stage fatality. No tag team in the demo, only 1 on 1. The single player part of the demo consist of the classic arcade ladder, you fight against the 4 characters and after you beat the fourth you go on to fight Goro…but an AWESOME montage video is shown instead, showcasing gameplay, more stages, x-ray moves, Kratos and other fatalities. Krypt is confirmed and in the montage video, it’s basically the same from previous games but way better looking. Confirmed “mini games” from the montage video: Test Your Might, Test Your Sight, Test Your Strike (precision based Test Your Might) and Test Your Luck (you can play this alone of versus a second player). You can also fight 1 on 1 against an opponent, in the select screen you can choose the arena with triangle, also there are options to choose the controller layout (you can customize up to 4 in the options menu) as well as random select and hide selection cursor. After you fight 1v1 locally you can either choose to rematch, change character or go back to the menu, if you choose rematch you will be taken to a load screen that lasts for about 1 second and then back to the fight in the same arena with the same characters. Kombat overall seems like a mixture of MKII and MK3 plus some elements from the 3D games, air combat is a lot like in MKII, combos aren’t dial-em up but rather short and it’s fairly easy to chain combos to special attacks and so on. The super bar is a great addition, you start with 2 bars, doing an enhanced special attack will use 1 bar, combo breaker uses 2 and x-ray uses all 3. Overall this adds a lot of technical value to the fighting mechanics, how and when you use your super bar can decide the outcome of the battle and I can see how this will make the game great to watch in events like EVO and such. Dan Forden is back, I played for around 4 hours and he popped in once after doing a combo that ended in an upprercut, apparently he appeas only in the Living Forest. Music and sound effects are top-notch, I played it on 5.1 and I was blown away, music is very reminiscent of classic games but with a modern feel to it, announcer has the coolest voice to date. Cage can do the nut punch (and enhanced version) to Mileena. There’s an option (grayed out in the demo) that reads “Social Messaging”, no information about this yet. A Living Forest stage fatality is shown during the montage video but I haven’t been able to perform it, maybe it’s not in. While you are advancing in the ladder, you can see some information, it shows the current difficulty, time, rounds and fights lost. If I notice something else I’ll add it to this post, feel free to ask questions via comments and/or by following me on Twitter. We’ve been told some hackers have dug deep into the demo and have gained access to the complete text dump of the english localization text file of the game, which reveals all the characters, test your luck modifiers, challenges, bios, endings, krypt contents (incomlete) and some story mode dialogue, this of course spoils a huge portion of the game, I’m still thinking through if I should put some of this info up on the site, stay tuned. One detail that you did not include is that much like MK vs. DC, this PS3 demo allows you to play custom music from the XMB, which I’m pretty sure will also be allowed in the final product. I got dan forden to pop up in the pit stage. BOSSES: goro,Shao Kahn,Kintaro …cool… Bot Were MOTARO EDDY? ( Its No Good) Its Trilogy or NOT!? 20,345 PEOPLE SAY THAT OUT FOR THIS GAME WILL NOT BUY! VERE SORY MR.BOON…. There is just a leash one day, and in mgre more cons than in previous parts … Oh the people I worry about. I understand that in the next often meet with smarter enemies and MIGHTY LORD SHINOK! If he is as a villain it is generally the end of all living things! Not bad for a new part of the fight with six of the outside world before entering the castle SHINOK LORD!